Customers that take to social media to complain are ignored to the tune of over 280 million messages per year. The retail industry is the worst offender, ignoring eight out of ten customers on social channels. Understanding the tools that help drive support, and engagement is imperative, not just for your current bottom-line, but for the future. Don't forget, Google is indexing all those complaints for all to see. 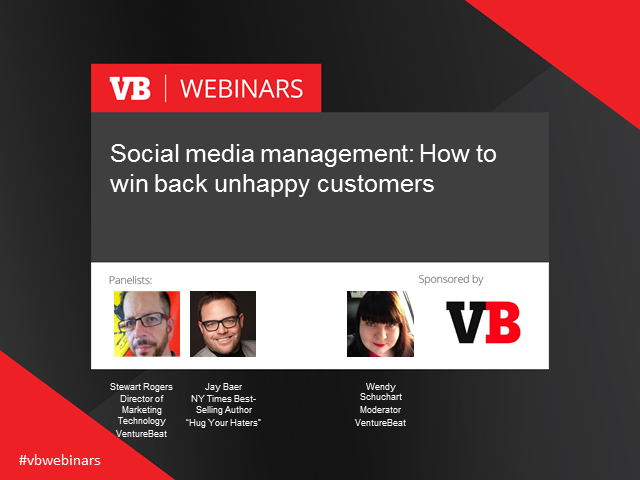 Join us to find out how to leverage social media management tools to win over unhappy customers. VentureBeat's own director of marketing technology Stewart Rogers is joined by New York Times' best-selling author Jay Baer ("Hug Your Haters" 2016) for this fast-paced half hour discussion, complete with audience interactive Q&A session. * Learn how to save face with your angriest customers -- and turn them into your most valuable asset. * Use social media management tools to curry favor with the faceless customers you don't even realize you had. * Increase customer engagement across the board. * Jay Baer, social media guru and best-selling author "Hug your Haters"
For more information on VB Insight, go to Insight.venturebeat.com to read the latest research and marketing analysis.